I don’t usually follow tips in travel guides, and if I do I often end up with a mediocre if not bad experience. 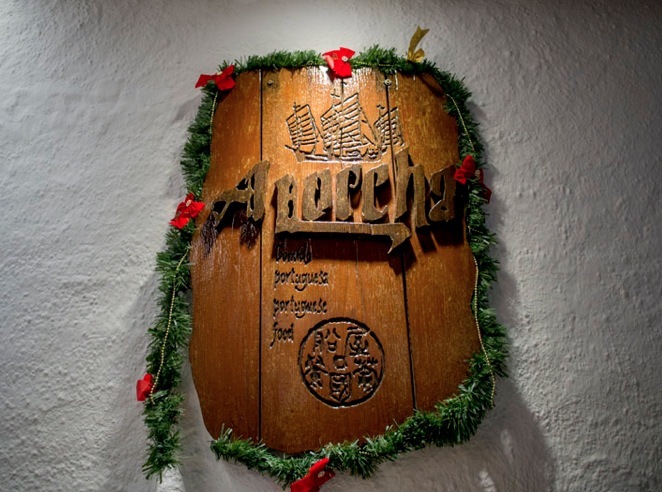 So I was very wary when we decided to visit A Lorcha, one of the famous (if not the most famous) Portuguese restaurants in Macau. When we arrived at 12:15 for lunch, people were already queuing outside. The restaurant opens at 12:30 (sharp) and that’s when seats are allocated. It’s best to reserve, as there only 20-25 tables in this restaurant – but we were lucky and managed to grab a small table for three. The restaurant is located just a stone throw’s away from A Ma Temple, so no wonder it’s full of tourists. I did’t see any locals there, but maybe that’s different late at night? Who knows. I don’t. Anyway, we sat down among the other tourists with their huge shopping bags, maps strewn on dining table, even bigger cameras and sunnies. 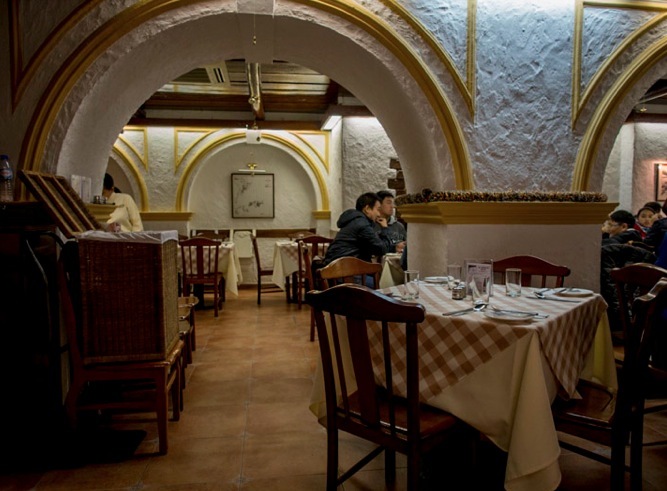 The restaurant is quite small, very narrow and without windows – but it is cozy with the warm glow of artificial lights, low ceilings and very friendly waiters. We ordered three dishes to share and while they were being prepared, we were served warm bread rolls and salty butter. 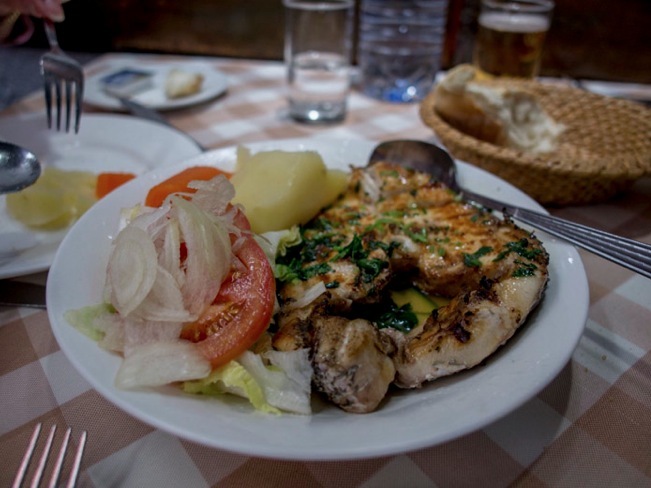 First, we had grilled sea bass with boiled potatoes and salad. A very big portion of fresh fish, with lots of olive oil and herbs. Very tasty and a great choice. 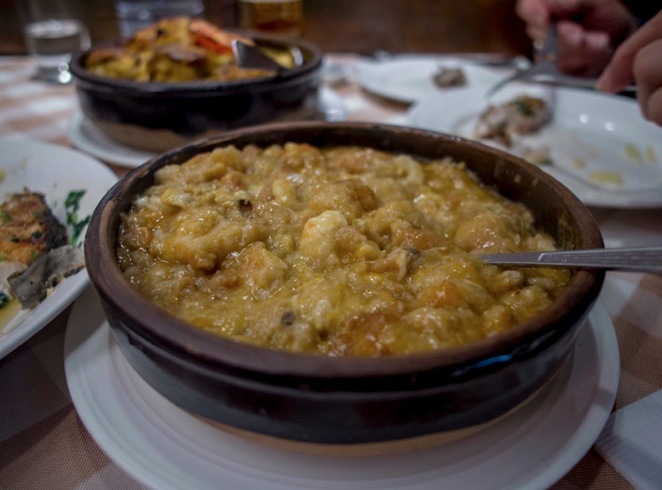 Next up was a seafood with bread stew – what sounds tasty was a bit of let-down. There was too much bread and too little seasoning in the dish. It was a little starchy and sticky, such a weird consistency. It would have needed some curry or paprika to lift it up a level – we only ate a little, it was not great. Unfortunately. 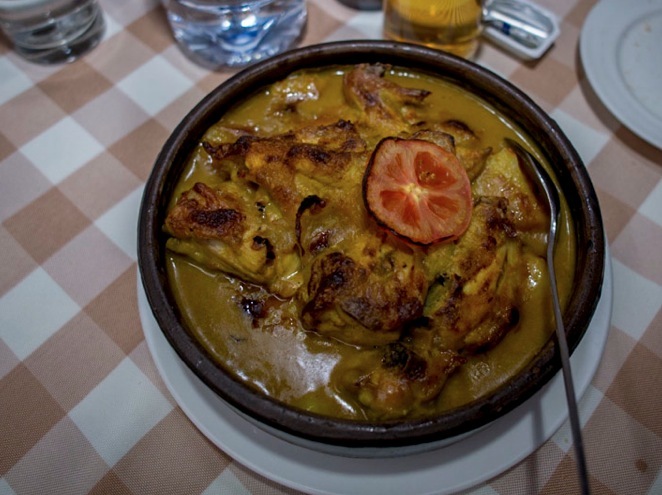 Luckily the third and final dish was great again – turmeric chicken. Nice, hot and tasty. Big pieces of chicken coated in a curry/turmeric sauce with potatoes cooked in the sauce. We also had a side of rice to go with the dish and soak up this dish. We finished it completely in just a few minutes, it was very tasty! Will I go there again? Yes, I’ve been back already. It’s a bit of a surprise, given it is such a touristy place. 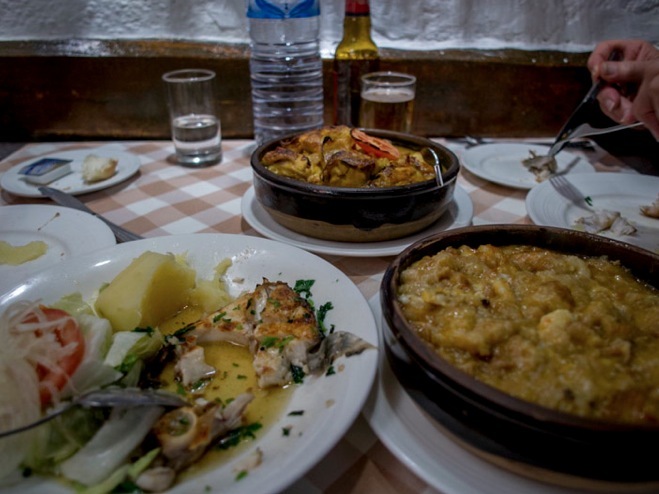 But the service is really friendly, I had 4 out of 5 dishes that tasted good and were authentic Portuguese (at least that’s what I can tell from my three holidays to Portugal many years ago) and given that there are not many Portuguese restaurants left in Macau, it’s a safe bet.